Love the one you marry ????? Two men, one American and an Indian were sitting in a bar and discussing about their family problems. Shot after shot. The Indian man said to the American: "We have problem in India. We can't marry the one whom we love. You know my parents are forcing me to get married to this so called homely and domesticated girl from a village whom I haven't even met once. We call this an arranged marriage. I don't want to marry a woman whom I don't love. I told my parents that openly and now have a hell of a lot of family problems." 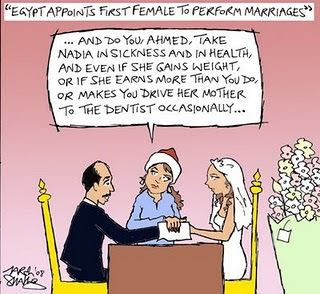 The American said: "Talking about love marriages, in America we can marry the one we love. Let me tell you my story. I married a widow whom I deeply loved and dated her for three years. After a couple of years, my father fell in love with my step-daughter and married her, so my father became my son-in-law and I became my father's father-in-law. Legally now my daughter is my mother and my wife is my grandmother. More problems occurred when I had a son. My son is my father's brother and so he is my uncle. The situation turned worse when my father had a son. Now my father's son, my brother, is my grandson. Ultimately, I have become my own grandfather and I am my own grandson. And you say you have family problems?"